This book, despite its address to an academic audience, is an important one for alternative walkers, urban explorers, psychogeographers and urban activists. 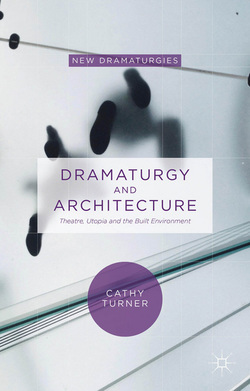 Its author, Cathy Turner, draws in very particular ways upon materials from theatre and architecture. Never very comfortable with the limits of either, she opens up and hybridizes ideas, patterns and precedents from histories of disruptive space-focused and site-specific performances and constructions; generating a resource of theory and tactics for anyone willing to read her book carefully. Turner brings to this book the receptivity and hesitations of a ’drifter’ (she is a member of Wrights & Sites), sensitive to the dangers of both “art-world recuperation” and of exaggerating the ‘resistant’ qualities of outsider interventions “where a détourned tourism could easily become a whimsical form of window-shopping”. She surveysand assesses various utopian projects – garden cities, Bauhaus, Gartenstadt Hellerau – and addresses their theatricality; teasing out a similar spatial utopianism in both Ibsen’s drama and on the revolutionary stage of Russian Constructivists. However, rather than defer to the apologetics of any particular set of ‘visionary’ architects or artists, she subjects their projects to the hard test of the experiencing human being in among them, using them, against them, on and under them, and it is in the contradictions she reveals that this book finds treasures. One story draws these narratives of contradiction together: in 1918, in St Petersburg, when Bolshevik artists built a structure decorated with political texts around the statue of Tsar Alexander III, “streets urchins” discovered that they could get into the gap between the two structures. They made it their meeting place and safe haven. This discovery of a space, a potent void, between an oppressive and striated hierarchy and a faltering smooth space of change, “between a rejected past and an urgently desired future city”, then reappears again and again in ‘Dramaturgy and Architecture’. Cathy Turner draws us subtly into these gaps in architecture – not the margins of a fashionable liminality, but more like precarious ‘wormholes’ that bring us abruptly close up with power – somewhere between the orderliness of intention and the anarchy of needs and desires, elaborating on their potential as crucial spaces for an urbanist activism/performance. This ‘wormhole’ is there in the way that architect Gottfried Semper’s frames of “earth, hearth... and membrane” pull away from his description of the “immateriality of the sky”, in the off-stage of what is not possible on the nineteenth century naturalist theatre stage, in the Constructivist acting machine that breaks away both from the theatre building and from its fictions, in the fracture between old and new beliefs that is Freud’s ‘uncanny’, in the stuttering in Robert Wilson’s theatre that “invites one to consider the constituent parts of both language and experiences as forms in their right”, and in the gap between the Arc de Triomphe and Krysztof Wodiczk’s skeletal structure that proposes not to demolish, but to “contain.... understand and deconstruct it”. The reader must work a little to find these invitations. Dramaturgy and Architecture asks them to be a hyper-sensitized explorer within its texts; looking out for the gaps, but also looking out for themselves. Because, for all the time that these narrow gaps or potent voids are opening, historical movements swamp and subject these opportunities to a ‘gesamtkunstwerk’, or to making everyday life artistic and rhythmic and consistent with “physical and moral hygiene”, or reducing agency to harmonic parts of an “architectural-spatial organism” that is wrapped in a gestalt peopled by ‘übermarionettes’ rediscovering the “essence of humanity”. Against these tendencies (and they are deep within treasured movements: modernism, communism, ecological idealism), Turner takes us first to multiplicity and “quantum spectatorship” – in the wild and rambling sources inspiring the theatre of Robert Wilson (via Sibyl Moholy-Nagy: “a car from 1950, a Renaissance chandelier.... a shoe”), in a theatre where “gaps between the fragments [of narrative] are larger than the fragments” and where a “a gap in understanding.... may lead to a restructuring of the field”. And, secondly, to the wandering of the senses and to the transformation of dead materials as advocated and briefly practiced by the Lettrist and Situationist Internationals, tripping repeatedly over their gestalt-vision of everyday life and backfiring anti-art iconoclasm. What Turner does, by finding messy gaps (in which the “patina and vibrancy” of old is still valued) between their quotidian-utopianism and the deadly purity of their iconoclasm, is to reclaim from a later theoretical and textual ‘puritanism’ some of the early International Lettrist impulses towards the void between “the sublime and the banal”; and towards the making of constructed situations that are not an enclave ‘within’ which to develop new and purified possibilities, but a clumsy dramaturgy of actors, without roles but with themes and motifs (leitmotifs stripped from their ‘gesamtkunstwerk’) that can intervene in urban life not in order to destroy its spectacle (or tear down the Arc de Triomphe) but to “create a new spectacle without location (a break in the space of play), without order, that no one would need to understand, but in which everyone would be able to find opportunities”. That final quotation is from a very un-Debord-like Guy Debord, writing with, significantly, a rare referencing of theatre. By posing a permeable (more than a retentively porous) dramaturgy – drawing on Carl Lavery, Simone Hancox and others - as both a critique and an addendum to ‘dérive’ and détournement’, Cathy Turner lifts these tactics out of the cul-de-sac of dreary iconoclasm in which they have often eroded and returns them (without recourse to Sinclairian shamanism) to what two former members of the British faction of the SI called the “’art’ dimension.... the continual pressure on the question of representational forms in politics and everyday life and the refusal to foreclose on the issue of representation versus agency”. It is in this thinking that ‘dérive’ is not “conceived as a way of life”, utopian and continual, but as “a passionate uprooting through the hurried change of environments”; not framed or walled in on islands of utopia or dystopia, but a re-making of passions and an uprooting of relations in the gaps between everyday spaces. While Turner’s final chapter on the site-specific performance work of Cliff McLucas rather draws multiplicity down to a concentrated, heterotopic super-site or event-space (privileged by its “negation of the everyday” [Lefevbre] and the absolution from responsibility of a ‘temporary autonomous zone’) where “all the other places in the culture are simultaneously represented, contested, inverted” (Pearson), and despite a first part of her Conclusion which perhaps too tightly knits her various threads together, this is a fabulous resource of ideas, narratives and practices for researchers, practitioners and activists operating in the gaps, voids and multiplicities of everyday space.